Is yours a meaningful organisation? Good advertising and product aren’t to be enough to engage consumer or employee loyalty today. Jim Antonopoulos says human-centric brands with focus on meaning and purpose driven leadership own the future. Most advertising is, at best, meaningless entertainment. At worst, it’s just noise. As customers, we demand more. It’s no accident that more and more, we look to the organisations we interact with each day, to reflect the meaning and purpose of our own lives. Product features, brand ambassadors, and celebrity endorsements may gain our attention, but they’re not the reason we stay. To enable a more complex, multi­layered discussion about purpose­ driven businesses, we need to acknowledge those layers. Ultimately, we want organisation to act with integrity. We want them to provide open and honest communication about their business practices and act with accountability when those actions don’t measure up to the values and expectations of their community and their customers. In the future, organisations will have a conscience that balances profit with purpose. They will develop products and services with deep regard for the customer and they will ensure that all stakeholders are catered for. They will become meaningful organisations that have positive impact within our lives. This meaningful organisation will be driven by courageous leaders who understand deeply the needs of the customers they wish to serve. These leaders ‘start with why’ and use empathy and purpose to drive their strategic plans. The Purpose­ driven Leader will be decisive, driven and will lead cultures where debates are healthy and plentiful. Empathy comes first in this new type of organisation and design is not a nice­-to­-have that happens at the end – it’s something embedded within the entire supply chain. This empathy is for consumers and employees, and it provides a product and service that fits their needs. Strategic plans will include detailed descriptions of the core customer’s needs and an inspiring narrative that drives organisational purpose. No longer will it be the role of the marketing function to fix business strategy issues. Patagonia is one such business. In 2012, Patagonia became a B-­Corp certified business (companies are assessed on their social and environmental performance by global non­profit B­-Corporation), a staggering achievement for a company pushing $600 million in global revenues. The commitment to a traceable supply chain and ethical sourcing of its materials, accompanied by a commitment to deliver fair ­trade wages and working conditions in the factories making its products, is a fundamental building block of Patagonia’s business model. Patagonia’s approach, when viewed from the perspective of growth and bottom line, can seem hypocritical. Achieving double­digit growth year after year through the marketing message of anti­-consumerism can come across as condescending; a six hundred million dollar corporate goods manufacturer preaching sustainability. But the reality is, through its practices of sustainability and corporate responsibility, every percent of market share Patagonia takes off its competitors incrementally makes the world a better place. At the core of Patagonia is a story crafted from a set of values and beliefs. They have developed metrics to measure the social and environmental impact of their business practices, and these metrics are actively promoted in a marketing message consumers can interpret and identify with. We want transparency and accountability from the companies that produce our goods and will form loyalties to brands that we trust. As a consumer, we are happy to pay a little more for a product that will need replacing less often, has a story attached that shows it was produced ethically and leaves a light footprint on the earth. One of the keys to the meaningful organisation is to build purpose into the very fabric of the company by embedding it in the strategic plan – gone are the days where a business strategy can’t answer, in detail who it’s core customer is, what they need, how it will provide it to them and why. Purpose will become a driving force of day-­to-­day activity, and employees will hold onto it, motivated by the knowledge that the work they do is providing a real ­world benefit for the community. Dustin Leonard came up with the idea for his company Hero Condoms as part of a marketing project while studying at university. Originally no more than a pipe dream, when Leonard saw that he could build a viable business that would truly make the world a better place, he started putting together a one-­for-­one business plan. For every Hero condom sold, a Hero condom is donated to a developing country to help fight HIV/AIDS. Hero is not a charity, the business is profitable, but profit is not its primary motivation – it’s purpose to make a sustained and significant difference in the lives of people who need help is equally balanced. Hero has so far donated 575,000 condoms to the people of Botswana, where HIV affects 25% of the population. On top of social responsibility, Hero is committed to environmental sustainability. All its products are manufactured using solar power, recycled water and packaged in 100% recycled packaging. Leonard says they are also well on their way to becoming a carbon neutral manufacturing company. Hero has pushed its way into an already saturated market (dominated by multinational corporations) by establishing these social and environmental principles as a foundation for business success. Hero and Patagonia share the basic principles of corporate and social responsibility and environmental sustainability, and they use it to underpin their businesses with a purpose and meaning that can be seen in everything they do. The leaders of these businesses drive a core purpose and a set of beliefs that they can call on to motivate and inspire the people that work for them and use as a tool to partner with like-­minded organisations. Ultimately, these businesses are growing simply by telling their unique story; by being authentic and true to their underlying values and principles and through a commitment to making the world a better place. The meaningful brand takes the empathy and purpose developed in strategic planning and ensures it influences heavily the development of the organisational identity. This brand connects with us on a deeper level – the origin story is far more memorable and compelling, the symbols representative and meaningful, it’s personality human. Lonely Planet’s ‘park bench’ founding story is a story that unites customers, staff and stakeholders alike. A story that binds people together and drive them forward towards a common goal. This is a story that creates identity. What both are saying is that brands should aim to satisfy deeper needs than simply the acquisition of goods or services. The meaningful, human­-centred brand satisfies this need. The expectation of brands to depict a true snapshot of humanity is real and it is now – Adidas’ ‘My Girls’ celebrates feminism, diversity, strength and ability. P&G’s ‘Like A Girl’ challenges gender stereotypes, Australia’s ABC, SBS, NITV, Triple J and Triple R all celebrate diversity in a way that commercial channels have yet to embrace. We live in a world where smiling white faces with shiny white teeth eat cereal in sparkling white kitchens in our advertising. Where it’s still OK to cast a woman whose daily pursuit is to look for a better laundry detergent in an advertisement that acknowledges that men are at work, and women aren’t. Where men are all the same (straight and of low intellect) and parental couple can only be male and female. The human-­centred brand shatters these norms and creates a new norm, a better norm a normality that is true, real and authentic. The human­-centred brand celebrates the beautiful array of skin colours, languages, ethnicities and cultures that can be seen on every street corner in most developed cities of the world. It has a true view of gender and it isn’t binary. The human­-centred brand tells men that strength reveals itself through character. It shows us that men too can wash dishes, seek help for mental illness, talk to their friends not grunt, look after children and do a load of washing while their partner is at work. Meaningful brands show us that families come in different shapes and sizes – that a child can have four mothers, or two mothers – no father or no mother – a mother and a father – two fathers; the combinations are endless, as is the necessity to show that family is family is family no matter what the combinations or permutations. The human-­centred brand is a feminist. The human­-centred brand celebrates humanity. Engaged and inspired employees stay longer, do the best work of their careers and are the first to champion the business purpose. In 2015, Tony Hsieh, CEO of Zappos, moved his organisational structure into a new model of working. Holacracy offered potential and possibility. A large percentage of employees left the business, but new, engaged employees also joined. People left for valid reasons – people joined for valid reasons. We search for meaning in our relationships, through art, through our spiritual endeavours and increasingly in our work. We spend the largest portion of every day working and we want to believe that our contribution matters and has a positive impact on the world. We must create a meaningful culture within our organisations; a message that is more than just systems and processes that lead to the end profit. Profit is only a by­product of doing business, not the end game, and if the only understanding of why the company is in business is centred around profit then the culture of the company fails. Both employees and stakeholders need a ‘why’ that can connect with them emotionally. The meaningful organisation hums with a rhythm of activity that lives and breathes the brand. New employees are welcomed and introduced to the organisation’s business strategy, brand and culture in a methodical, meaningful and impactful way – a way that has them proudly saying to their friends and partners, ‘I work here!’. At the breakout session ‘How to Community’, Helen Souness of Etsy Australia, an online marketplace where consumers buy directly from the maker, shared her advice for businesses that place values above all else. In her mind, it’s all about the people you bring on board. At the other end of this are prospective employees who want to work for an organisation whose values align with their own. Alicia Darvall in Becoming a B­-Corp echoed this sentiment that having purpose makes it easier to find your tribe. “There’s a new generation who don’t want to check their values at the door. If you’re a B­-Corp, people want to work with you,” she explained. In fact, purpose­ driven employees (those motivated by the work itself rather than a payslip) perform significantly better than other workers, according to a recent study. In short, have purpose. If you don’t have one, find one. Be about something bigger than what you do day-­to-­day. Doing so will ensure the right employees seek you out. A meaningful experience is what happens when someone comes into contact with an organisation and walks away feeling better than they did before. They feel valued as if their ethics and beliefs were reflected in that business. Meaningful experiences are conversations – the two way, collaborative, immersive kind of conversations. Organisations must go beyond advertising messaging and taglines to design experiences that are meaningful. In reality, customers, staff, and stakeholders don’t care about our organisations (business and brands) all the time. In truth, they’re not even thinking about us most of the time. People want to be made to feel something. Advertising in itself is a series of questions that must be answered—from ‘who are you?’, to ‘what’s in it for me?’. Advertising has become, simply yet another brand experience that our staff, employees, customers, clients and stakeholders journey through to reach goals that meet their needs, and our own. Content is the cost of entry to remain relevant in a world of noise—content is a way to create meaning in the lives our people by providing consistent value in the lives the people that interact with our brands. Delivering useful and meaningful content goes beyond soulless advertising that exists as an end in itself (we all know those ads we laugh at and soon forget the product). The meaningful experience stays with us. Meaningful impact is measurable, transparent and ethical. After all, if you can’t measure it, how can you be sure it’s real and not just lip service? Meaningful impact helps people and the environment and doesn’t shirk its responsibilities. Fulfilling corporate responsibilities and committing to sustainable practices and fair trade wages are just the beginning. A truly meaningful organisation will find a way to link its commercial interests with its desire to make a difference, and not concentrate on one to the detriment of the other. Meaningful impact begins with understanding the people at the centre of your business and the community you serve. There is a new type of leader emerging. She is an entrepreneur, a strategist, a design thinker. She is a visionary and is ready to make things happen at the drop of a hat using design thinking and human­-centred design as her key tools. She sees opportunities where others see obligations and owns both success and failure in equal measure. 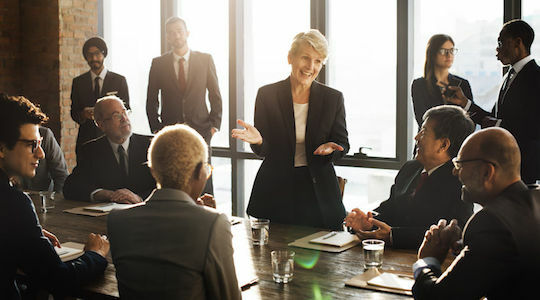 A purpose­ driven leader is one that is capable of developing the human capital around them and is sensitive to the needs of the people they employ. This style of leadership takes her out of the building and into the communities she serves; working with them to better understand their needs, passions and points of view. She understands that selling more of what people don’t really need is not a meaningful KPI, and instead she inspires her team to develop products and services that solve real world problems. She knows that satisfying these real world needs will create prosperity for everyone. An example of this in action is Australian company Amazonia. Amazonia CEO Dwayne Martens has built his entire business model around the core values of corporate, social and environmental responsibility. Martens lives, eats and breathes this ethos and it is present at every level of his growing business. Amazonia is best known for its production of healthy snacks from the nutrient dense Amazonian Acai berry. The company has expanded its product lines since founding in 2008 to include natural vitamins, protein powders, and pre-­probiotics that are produced from organic, fair­ trade and sustainably harvested crops. With year-­on-­year growth of between 100% and 350%, Martens is building a company around a fundamental set of beliefs; that our food should be sourced sustainably, the producers compensated fairly and the production should leave the ingredients in as raw a form as possible. He works with locals on the ground in the Amazon, supplying financial incentives to villagers to harvest the berries by hand and reduce land clearing. These are practices he is modelling as he expands the business with new products using coconuts from Thailand and Ecuadorian Cacao. It is Martens’ belief that we are what we eat and every time we hand over our money for a product we are making a choice about how our food is produced. This isn’t an isolated case. Keep Cup, Warby Parker, Patagonia, we are surrounded by organisations embracing their purpose and creating meaning. In fact, what these businesses tell us is that purpose can be a competitive advantage. Do you think any savvy business person would have backed a small, local toilet paper company (Who Gives a Crap) to enter the market successfully against established giants in the environment of Australia’s supermarket duopoly? Probably not. What about a toilet paper company which donates 50% of their profits to sanitation projects in the 3rd world? No way? That’s exactly what Who Gives a Crap has done through living their purpose. The one thing they stand for. And that’s good business. Jim Antonopoulos, director of strategy and development at Tank is an advocate for B Corporations and a more human approach to creativity. He has had a long passion for understanding how people interact with brands, culture and technology. Inspired by human-centred design and an advocate for flat, more collaborative organisational structures, Jim works with leadership teams to help create meaningful organisations that have purpose and empathy for the people they serve.